We are not your average Rotomolder. We don’t measure our operation in terms of pounds of throughput of ho-hum industrial parts. We measure ourselves by clients that have never seen their parts look so good. If you have become accustomed to average quality rotational molding, let us raise your expectations. We operate two natural gas fired Rotational Molding machines – a 2- arm shuttle and a 3-arm carousel with numeric temperature and cycle time controllers. We specialize in large parts and more complex molding solutions including custom colors, mold-in graphics, threaded inserts, and assembly services. Rotomolding, also known as Rotational molding, consists of several parts which includes molds, an oven, a cooling chamber and mold spindles. 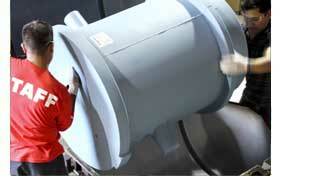 The spindles rotate on an axis which provides a uniform coating of the plastic inside the mold. Slowly rotating a heated mold causes the softened material to disperse and stick to the walls of the mold. To assure an even thickness throughout, the mold is rotated through the cooling process. Molds or tooling, as its known in the trade, are either made from stainless steel or aluminum, and we prefer aluminum since aluminum's thermal conductivity is many times greater than steel. Due to the need to develop a model prior to casting, cast molds tend to have additional costs associated with the manufacturing of the tooling, whereas fabricated steel or aluminum molds, particularly when used for less complex parts, are less expensive. . The aluminum has other benefits in addition, providing more heat capacity, causing the melt-flow to stay in a fluid state for a longer period. Rotomolding has a number of parts including molds, oven, cooling chamber and mold spindles. The molds simply create the part. The oven is used to heat the part while also rotating the part to form the part desired. The cooling chamber is where the part is placed until it cools, and the spindles are mounted to rotate and provide a uniform coat of plastic inside each mold. Rotational molding offers design advantages over other molding processes. With proper design, parts assembled from several pieces can be molded as one part, eliminating high manufacturing costs. Consistent wall thickness and strong outside corners that are virtually stress free are benefits and additional strength, reinforcing ribs can be designed into the part. Metal threaded inserts, necessary for easy attachment or assembly is easily achieved, and different colored graphics can all be added to the mold. Multiple colors of "mold-in" graphics are an easy and cost effective way of permanently adding logos, product descriptions/warning labels etc. Another advantage lies in the molds themselves. They can be built and put into production much more rapidly than other tools for other plastic manufacturing processes. 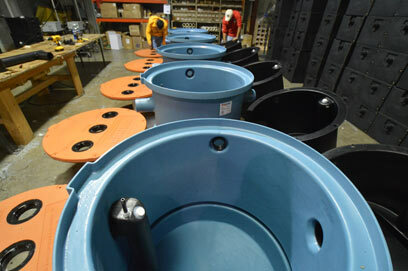 Rotational molding is also the desired process for short runs and rush deliveries. We can accommodate orders as small as 25 piece runs. The molds can be swapped quickly and different colors can be used in the same mold to produce different (mono-chromatic) colored parts during the same production run without purging the mold.